I can hardly believe that it's July 21! It feels like this race was just last weekend. Anyway, here's my recap for the Red, White & Boom! 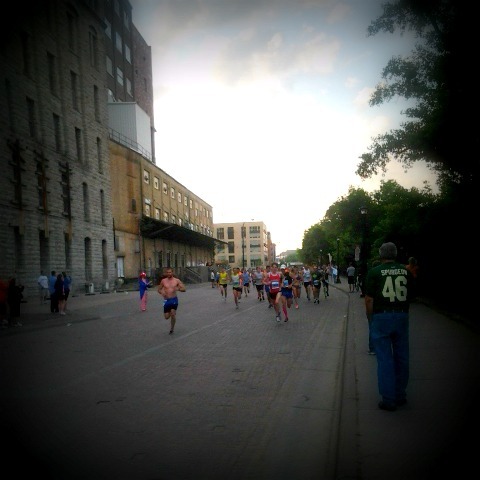 TC Half Marathon Relay (whew!). It's on the 4th of July every year, so if you have family in town and are looking to start some sort of healthy tradition, this is it. 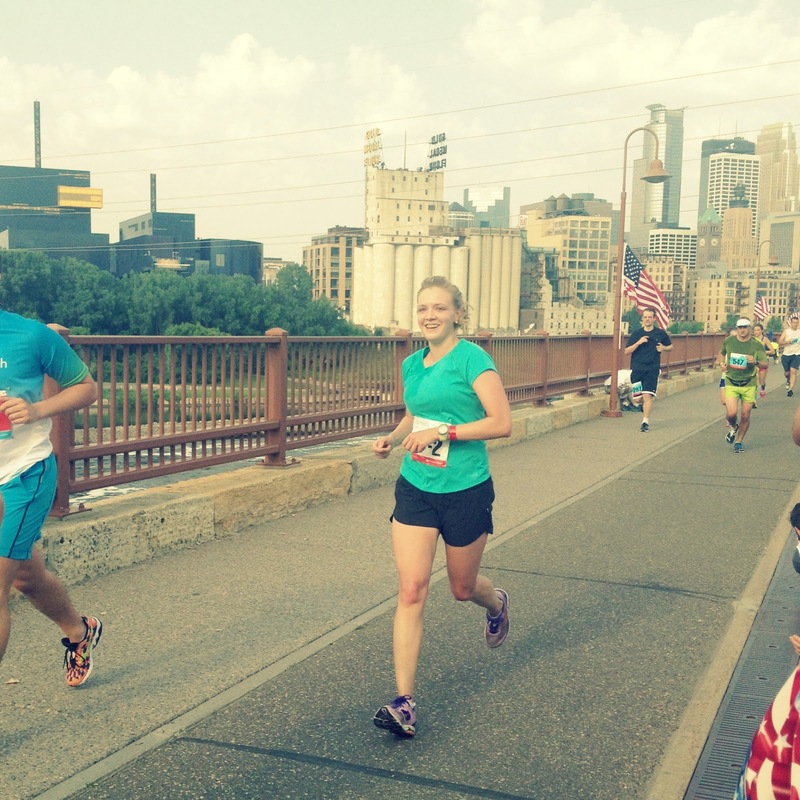 The relay portion makes it accessible to those that maybe aren't comfortable running the entire half. That being said, it's really flipping hot. 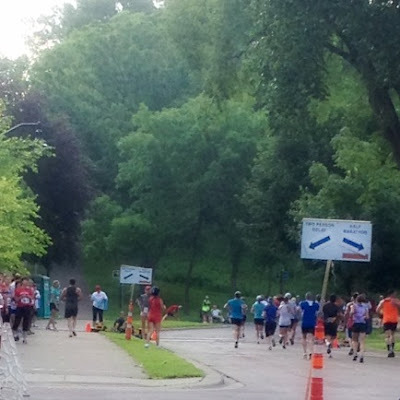 They start the race at 6:30 to try to beat the heat, but it's July in Minnesota, so it's to be expected. I wouldn't really plan this race for a PR or anything. Because it starts so early, don't expect a lot of spectators. They have course entertainment every so often but you're basically just running by a band for 30 seconds. Regarding the relay, in my opinion, the first leg is the harder one. Yes, the second leg starts with Norwegian Hill, but it's literally all downhill from there. The first leg has three hills, all pretty steep. Okay, on to the race. So I ran with John, who has not run 6.5 miles in probably eight years. 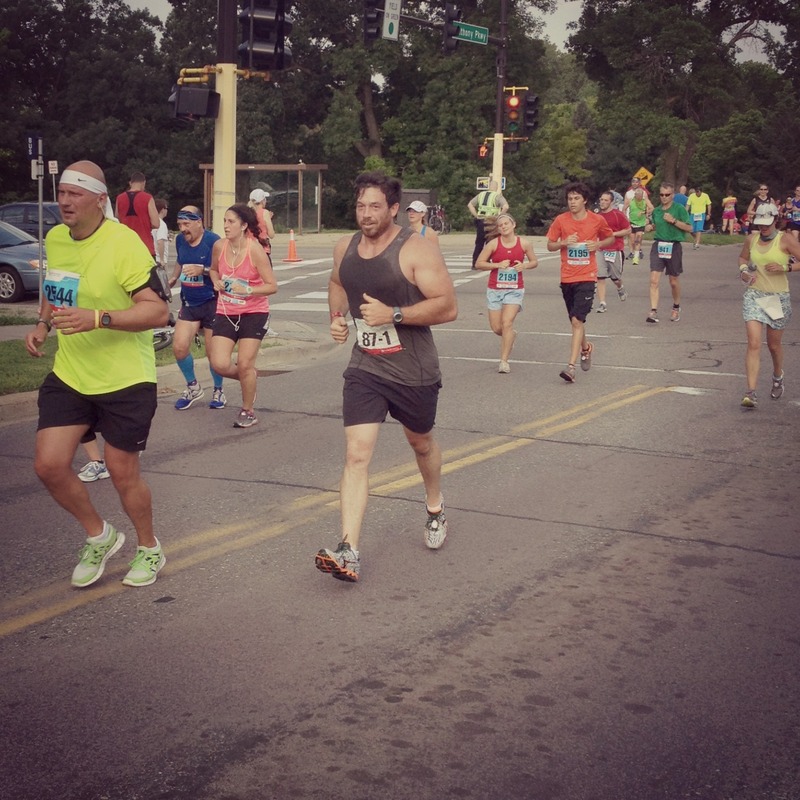 He'd only been training a few weeks, and his longest run was five miles. We toured part of the course earlier in the week and decided that he would run the first half, mostly so he could start with a larger group and sort of feed off that energy. We drove to the start line and got there a little before 6:00 a.m. 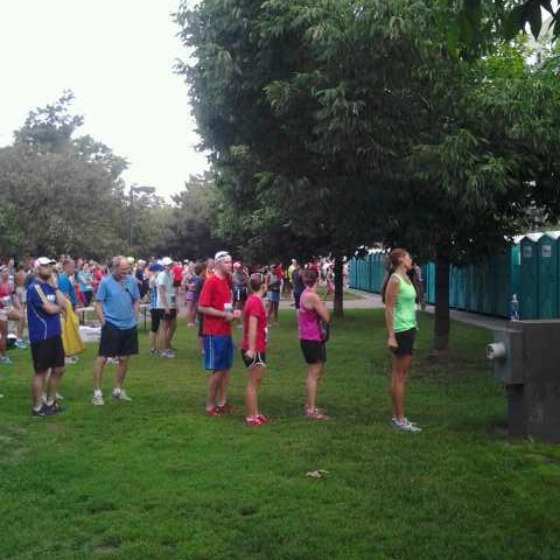 There was already a long line for the porta-potties, which was unfortunate for John who was experiencing his first case of "nervous bladder." 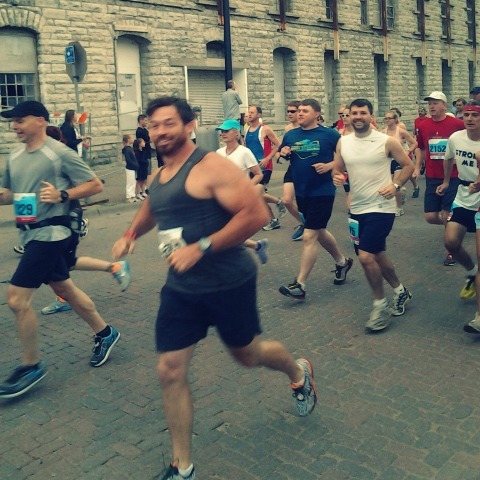 Shortly after John got into the corral and I walked down the course so I could see everyone start. Rather than take the bus to the transition area, Colleen and Julie were the best friends ever and gave me a ride there so they could see John finish his first race. We got there with plenty of time to spare but I wasn't really in "race" mode so I chatted instead of warming up. At. All. Soon enough I saw John coming and ran up to the transition area. Julie got this picture of him. I wanted to make my first mile my slowest because it was the only one that had the gigantic hill but with the excitement of the race, that didn't really happen. Plus, immediately after you get to the top of it, you're rewarded with a long downhill. I didn't really look at my watch and just ran on feel until the last two miles. I was getting pretty warm (but got chills- never a good sign) and just wanted to be done. 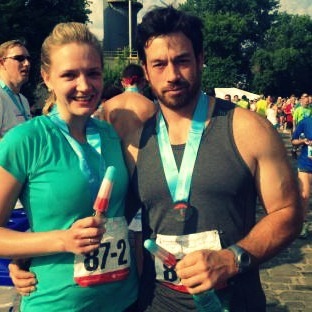 The best part of this race: Popsicles. And chocolate milk, hot dogs, and a bunch of other stuff that I didn't bother to eat. Instead, we walked down to Wilde Roast and had an amazing breakfast. And that's the story of our first race together (though probably not our last).